Please arrive for lessons at least 10 minutes BEFORE the start time. We are a local Karate club, established in this area some 24 years ago; our club has welcomed members of the local community providing the ultimate in self defence training, whilst delivering improved fitness and self confidence. Our students have ranged from 6 year olds to 66 year olds our qualified instructors have coached students to the limits of their potential and beyond. The style we practice is ‘Shukokai’ the word means ‘way for all’ this modern style of karate blends the strength and grounding of the tradition styles with an advanced, scientific interpretation of the martial art. 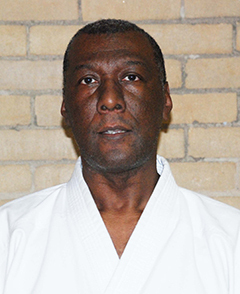 I have been a black belt instructor for over 27 years, and have successfully competed at international level as part of the Shukokai Karate Federation England squad and a member of the All Styles England Karate Squad. My present status is that of sixth Dan Chief Shukokai instructor for the Fudoshin Karate Kai association. We operate a robust training syllabus designed to support our student’s progress through the various grades defined by coloured belts. The club offers a relaxed & friendly training environment, which observes and respects the needs of the individual, whilst promoting the ethics of social team. Fee £10.00 Jnrs & Snrs. This course is for general skills improvement, self defence, basics etc. Please be reminded that this years FKK AGM will be held on Sunday 10 February 2019 at Coseley Leisure Centre meeting room, start time 12:00am. All FKK members are invited particularly black belts and brown belts. Attend and have your say on our future. Light refreshments will be available.